Over the years I have created hundreds of pieces for people’s homes and businesses. I’m gratified to note that I have a great many repeat customers. Because furniture is so site-specific, much of the work I do is commissioned to fit in a particular space, to serve a particular purpose and to express a desired sensibility. All of these factors influence the design and materials to be used in a commissioned piece of furniture. Once I know the general specifications I look through my inventory of raw materials to select options. Sometimes drawings are made, sometimes photo images are sent via email, sometimes models are made. The most satisfying procedure, because of its immediacy, is for the client to be here in our studio discussing and looking at the actual raw material with me. But since that’s not always possible, other successful avenues are available. I’m usually able to offer options in several price ranges. The price of a piece of furniture is based upon its size, its complexity and the specific woods used. Because of the unique qualities of the raw materials, each piece I make is original. 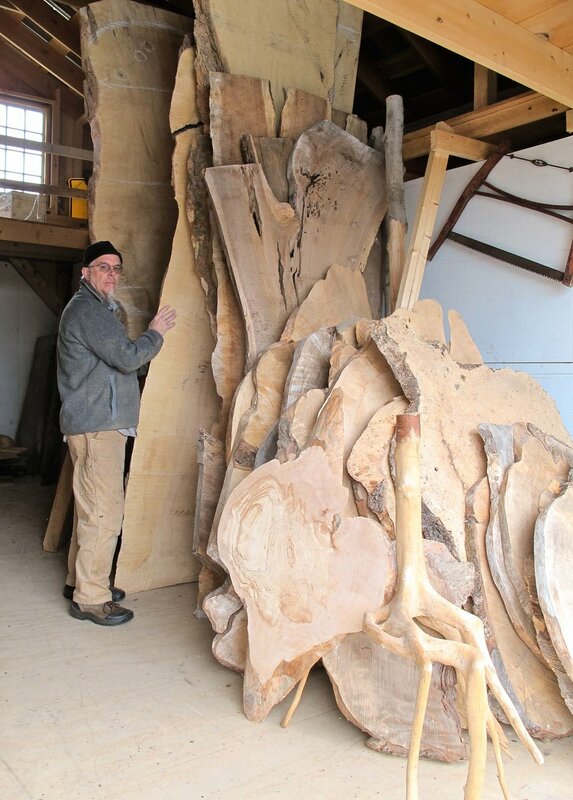 Commissioning a piece of furniture begins a conversation between you, me and the Vermont hardwoods I use.